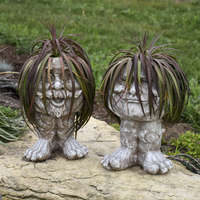 Mad About Mangave® Collection | Walters Gardens, Inc. Height: 8-10" - Width: 18-20"
Height: 12-16" - Width: 18-22"
Height: 18-24" - Width: 24-30"
Height: 6-8" - Width: 30-32"
Height: 8-10" - Width: 28-30"
Height: 8" - Width: 16-20"
This attractive succulent has a low, wide habit with large, attractive spotting from its Manfreda blood, and thick, wide leaves from its Agave blood. Dark green leaves with blood red spotting arch downward, perfect for framing decorative containers. 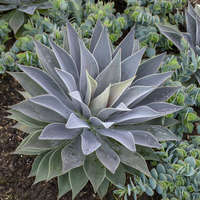 Although striking white spines line the curled up margins, these aren't deadly like you would expect from Agave, but softer to the touch. 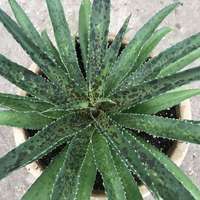 More exposure to UV light will brighten the dark coloration and the spotting. Height: 6-8" - Width: 18-22"
This incredible sport of Mangave ‘Jaguar' is named for the many different colors that are present on the leaves at any given time. 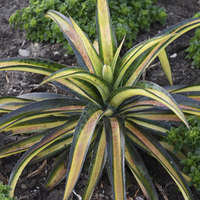 The long, lance-shaped leaves are deep green with creamy yellow margins, with a narrow band of light creamy green where the centers and margins overlap. 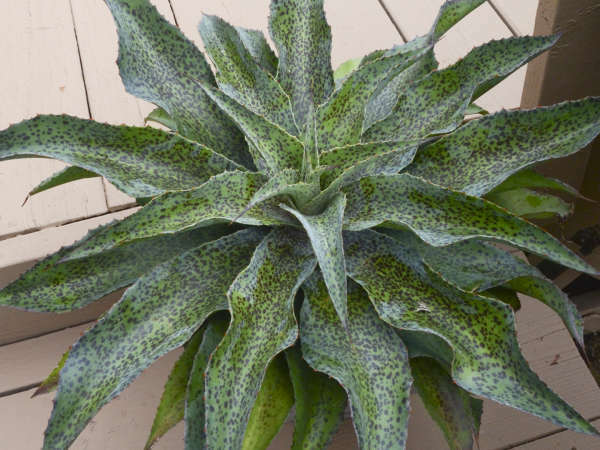 Bright rosy red dots lightly cover the leaves. 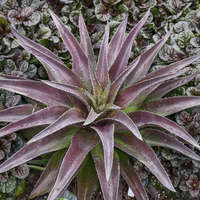 Margins are lined with a thin rosy red edge, creating a unique look to the leaves. Direct sunlight draws the most intense coloration, and margins glow nearly orange due to the rosy red lining. 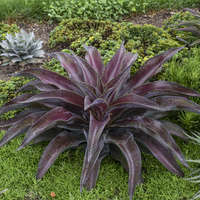 The brightly colored leaves form an arching habit of foliage, perfect as a centerpiece for a container. 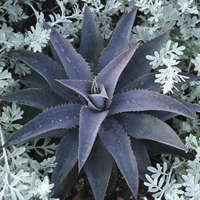 Height: 24-28" - Width: 32-36"
‘Lavender Lady' is a unique, feminine beauty whose solitary rosette habit and smoky purple coloration make it look very similar to an Echeveria. 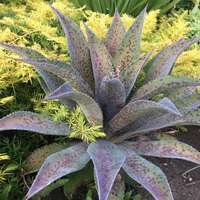 In direct sunlight, smoky purple leaves are formed at the top of the rosette and have subdued burgundy purple dots. 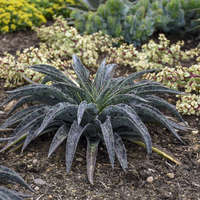 As the rosette ages, the ovate leaves lighten to green, forming a two-tone effect. Each 1½in wide leaf has a cinnamon brown terminal spine. 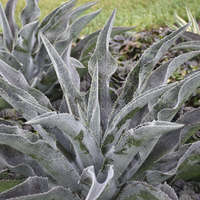 The margins are lined with tiny white spines; running your fingers along them feels like a comb, as they are fairly benign. 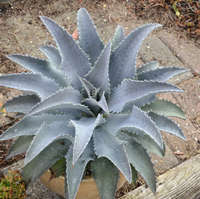 Its broad leaves combine well with Mangave with narrower leaves, like ‘Man of Steel'. 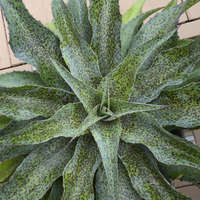 Height: 8-10" - Width: 12-16"
This Mangave produces a medium-sized rosette of narrow, sword-like leaves. 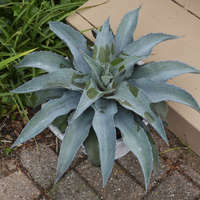 Attractive silvery green leaves get their light color due to a waxy coating. 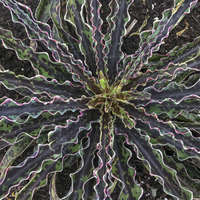 The 7in long, lightly colored leaves form tidy, refined, circular rosette. 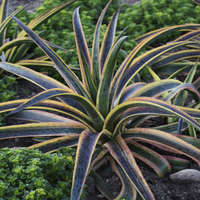 Each ½in wide leaf is thinly lined with a cinnamon orange margin that is slightly rough to the touch. 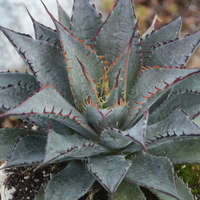 Long, terminal spines are matching in color to its margin. 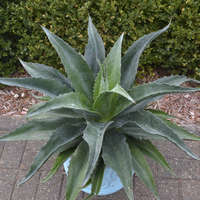 The leaves are not quite as thick as you would expect from an Agave, so this Mangave is easy to handle and work with. 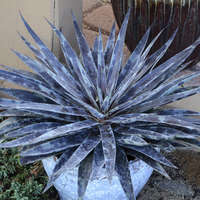 This is a great counterpart to ‘Lavender Lady' due to their similar size and complementing colors and form. 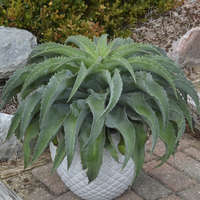 Height: 6-8" - Width: 12-16"
Height: 12" - Width: 22-24"
Enjoy this unique-looking succulent for its incredibly wavy leaves and intense spotting. 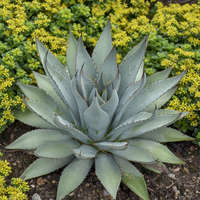 Long, silvery blue-green leaves are succulent, but not as rigid as Agave. 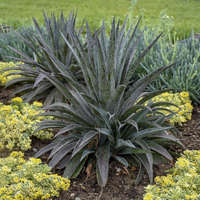 Near-black spotting is present on both on the fronts and backsides of the leaves, and contrasts beautifully with the lighter colored leaves. 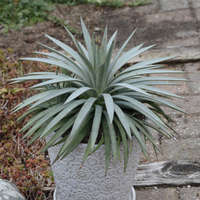 A very fine white margin lines the edges of the leaves with a serrated edge. 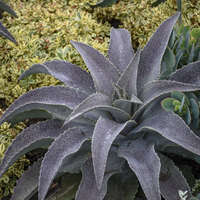 Compared to ‘Chocolate Chips', this plant has wider leaves, darker spotting, and more silvery blue leaves. 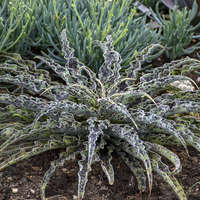 Its wide, ground-hugging, low habit lends itself well to combination succulent containers—try it with broader leafed Mangave! 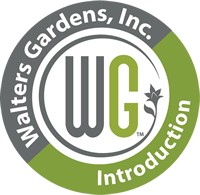 Height: 6-8" - Width: 18-24"
Height: 8-10" - Width: 20-22"
Height: 8-10" - Width: 16-20"
Height: 8" - Width: 16"
Height: 9-10" - Width: 16-18"
Height: 12-16" - Width: 16-24"
Height: 16-18" - Width: 24-26"
Height: 8-10" - Width: 16-18"
Height: 10-12" - Width: 16-18"
Height: 7-8" - Width: 22-26"